Most training programs last about 1-year and are offered by vocational or technical schools or community or junior colleges. Overall job prospects are expected to be very good, but job outlook varies by industry. Replacement needs will be a major source of job openings, as many workers leave the occupation permanently. Today is and a good time to start thinking about a career in health-care and nursing... Licensed practical nurses (LPNs), or licensed vocational nurses (LVNs), care for people who are sick, injured, convalescent, or disabled under the direction of physicians and registered nurses. The nature of the direction and supervision required varies by State and job setting. Licensed practical nurses may assist patients with bathing, dressing, standing, and walking. LPNs care for patients in many ways. Often, they provide basic bedside care. Many LPNs measure and record patients' vital signs such as height, weight, temperature, blood pressure, pulse, and respiration. They also prepare and give injections and enemas, monitor catheters, dress wounds, and give alcohol rubs and massages. To help keep patients comfortable, they assist with bathing, dressing, and personal hygiene, moving in bed, standing, and walking. They might also feed patients who need help eating. Experienced LPNs may supervise nursing assistants and aides. As part of their work, LPNs collect samples for testing, perform routine laboratory tests, and record food and fluid intake and output. They clean and monitor medical equipment. Sometimes, they help physicians and registered nurses perform tests and procedures. Some LPNs help to deliver, care for, and feed infants. LPNs also monitor their patients and report adverse reactions to medications or treatments. LPNs gather information from patients, including their health history and how they are currently feeling. They may use this information to complete insurance forms, pre-authorizations, and referrals, and they share information with registered nurses and doctors to help determine the best course of care for a patient. LPNs often teach family members how to care for a relative or teach patients about good health habits. Most LPNs are generalists and will work in any area of health care. However, some work in a specialized setting, such as a nursing home, a doctor's office, or in home health care. LPNs in nursing care facilities help to evaluate residents' needs, develop care plans, and supervise the care provided by nursing aides. In doctors' offices and clinics, they may be responsible for making appointments, keeping records, and performing other clerical duties. LPNs who work in home health care may prepare meals and teach family members simple nursing tasks. In some States, LPNs are permitted to administer prescribed medicines, start intravenous fluids, and provide care to ventilator-dependent patients. Work environment. Most licensed practical nurses work a 40-hour week. In some work settings where patients need round-the-clock care, LPNs may have to work nights, weekends, and holidays. About 18 percent of LPNs and LVN’s worked part-time in 2008. 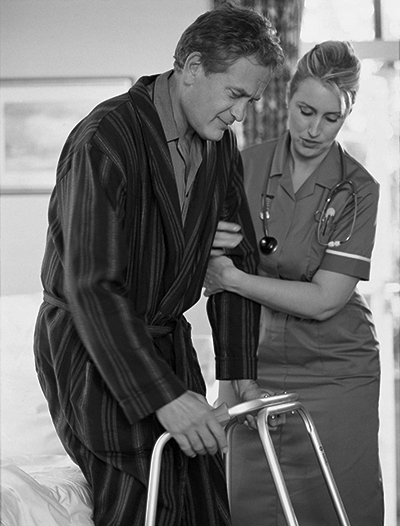 They often stand for long periods and help patients move in bed, stand, or walk. LPNs may face hazards from caustic chemicals, radiation, and infectious diseases. They are subject to back injuries when moving patients. They often must deal with the stress of heavy workloads. In addition, the patients they care for may be confused, agitated, or uncooperative. Most practical nursing training programs last about 1 year, and are offered by vocational and technical schools or community or junior colleges. LPNs must be licensed to practice. RPNs and LPNs must complete a State-approved training program in practical nursing to be eligible for licensure. Contact your State’s board of nursing for a list of approved programs. Most training programs are available from technical and vocational schools or community and junior colleges. Other programs are available through high schools, hospitals, and colleges and universities. A high school diploma or its equivalent usually is required for entry, although some programs accept candidates without a diploma, and some programs are part of a high school curriculum. Most year-long practical nursing programs include both classroom study and supervised clinical practice (patient care). Classroom study covers basic nursing concepts and subjects related to patient care, including anatomy, physiology, medical-surgical nursing, pediatrics, obstetrics nursing, pharmacology, nutrition, and first aid. Clinical practice usually is in a hospital but sometimes includes other settings. Licensure. The National Council Licensure Examination, or NCLEX-PN, is required in order to obtain licensure as an LPN. The exam is developed and administered by the National Council of State Boards of Nursing. The NCLEX-PN is a computer-based exam and varies in length. The exam covers four major Client Needs categories: safe and effective care environment, health promotion and maintenance, psychosocial integrity, and physiological integrity. Eligibility for licensure may vary by State; for details, contact your State’s board of nursing. Other qualifications. LPNs should have a caring, sympathetic nature. They should be emotionally stable because working with the sick and injured can be stressful. They also need to be observant, and to have good decision-making and communication skills. As part of a health care team, they must be able to follow orders and work under close supervision. LPNs should enjoy learning because continuing education credits are required by some States and/or employers at regular intervals. Career-long learning is a distinct reality for LPNs. Advancement. In some employment settings, such as nursing homes, LPNs can advance to become charge nurses who oversee the work of other LPNs and nursing aides. LPNs may become credentialed in specialties like IV therapy, gerontology, long-term care, and pharmacology. Some LPNs also choose to become registered nurses through LPN-to-RN training programs. Licensed practical and licensed vocational nurses held about 753,600 jobs in 2008. About 25 percent of LPNs worked in hospitals, 28 percent in nursing care facilities, and another 12 percent in offices of physicians. Others worked for home health care services; employment services; residential care facilities; community care facilities for the elderly; outpatient care centers; and Federal, State, and local government agencies. Employment of RPNs and LPNs is projected to grow much faster than average. Overall job prospects are expected to be very good, but job outlook varies by industry. The best job opportunities will occur in nursing care facilities and home health care services. Employment change. Employment of LPNs is expected to grow by 21 percent between 2008 and 2018, much faster than the average for all occupations, in response to the long-term care needs of an increasing elderly population and the general increase in demand for health care services. Demand for LPNs will be driven by the increase in the share of the older population. Older persons have an increased incidence of injury and illness, which will increase their demand for health care services. In addition, with better medical technology, people are living longer, increasing the demand for long-term health care. Job growth will occur over all health care settings but especially those that service the geriatric population like nursing care facilities, community care facilities, and home health care services. In order to contain health care costs, many procedures once performed only in hospitals are being performed in physicians' offices and in outpatient care centers, largely because of advances in technology. As a result, the number of LPNs should increase faster in these facilities than in hospitals. Nevertheless, hospitals will continue to demand the services of LPNs and will remain one of the largest employers of these workers. Job prospects. In addition to projected job growth, job openings will result from replacement needs, as many workers leave the occupation permanently. Very good job opportunities are expected. Rapid employment growth is projected in most health care industries, with the best job opportunities occurring in nursing care facilities and in home health care services. There is a perceived inadequacy of available health care in many rural areas, so LPNs willing to locate in rural areas should have good job prospects. Median annual wages of licensed practical and licensed vocational nurses were $39,030 as reported in past few tears. The middle 50 percent earned between $33,360 and $46,710. The lowest 10 percent earned less than $28,260, and the highest 10 percent earned more than $53,580.